Both Pompeii and Herculaneum, its neighbor in western Italy, were thriving in 79 AD. With their location on the Bay of Naples, their affluent residents, and their thriving economies, they were showplaces for displays of wealth among the newly rich merchant classes – as well as the nobility who vacationed there. 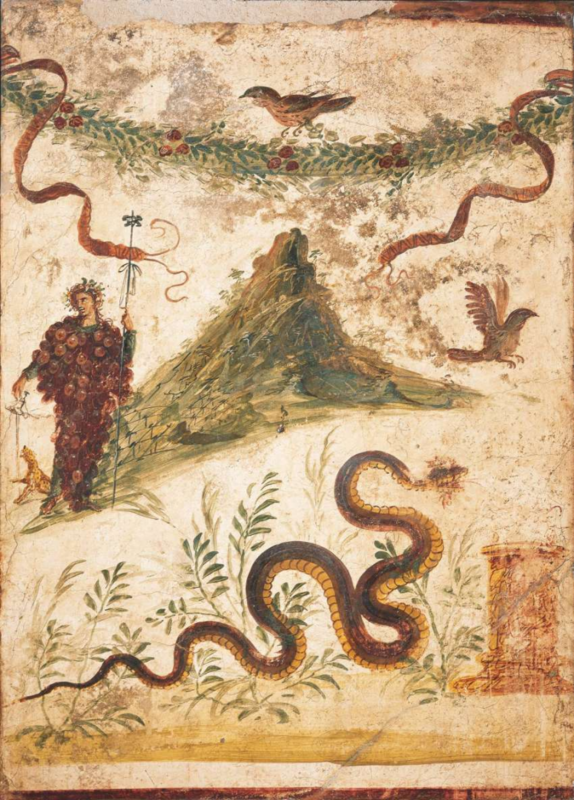 Villas spread out, leisure life meant a great deal of entertaining, and…Mount Vesuvius erupted. For many, the tragic elements of the exploration of the Pompeii ruins and the discovery of the Pompeii bodies are what spring to mind when the name of the city comes up. 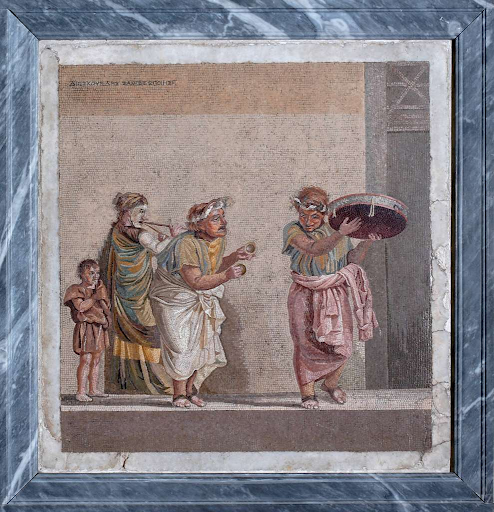 The Pompeii mosaics and frescoes document a city that was a bustling industrial center. Its proximity to both the fertile agricultural regions and shipping ports allowed for a robust economy. Pompeii history stretches back to the 6th century BC, when the first settlers were able to build on the lava terracing that had formed centuries earlier. By the time of the catastrophic eruption, the city would have had around 20,000 residents – 40% of them slaves. The market activities supported the population well – over 600 shops, workshops, and inns have been discovered. The residents were no different than people today: They drank wine at taverns, they watched sports at the amphitheatre, they engaged in social activities, watched performances of music and theater, went shopping, and discussed politics. 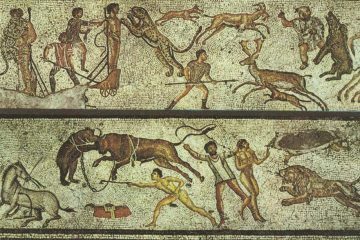 They also participated enthusiastically in public baths, which are a rich source of the Pompeii mosaics and frescoes that were unearthed. 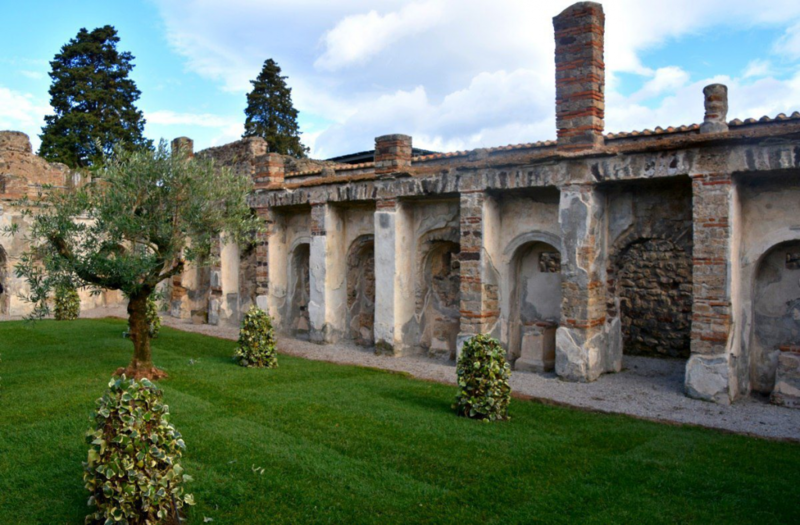 The cultural aspects of the baths were broad: supplying an “opportunity to satisfy not only the well-being of the body, but also of the spirit,” wrote Cantarella and Jacobelli. While there, visitors would exercise and play sports, indulge in a range of therapies such as a massage, stroll in the gardens, listen to music and poetry recitals, read in the library, and even conduct business. 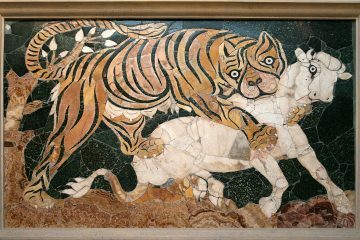 The mosaic floors that survived the Pompeii volcano eruption remain surprisingly vibrant and have become iconic. 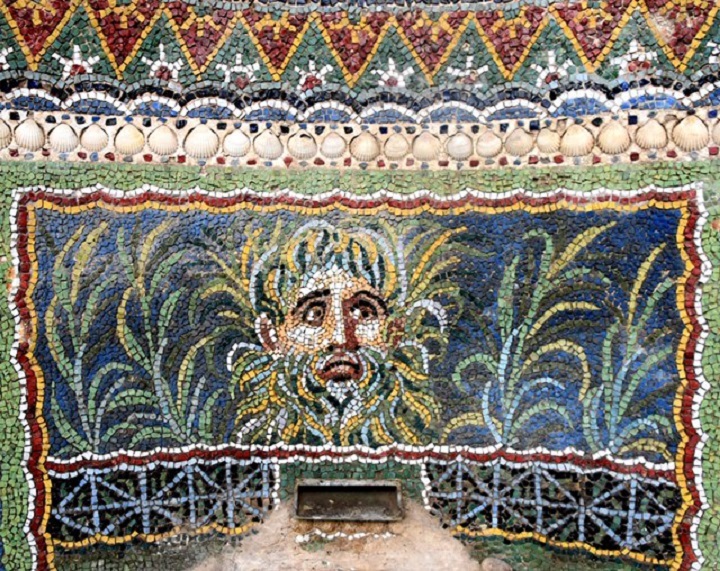 Famous examples that can be summoned by name alone include the “Beware of Dog” (Cave Canem) piece from the Domus of the Tragic Poet, or the Pompeii Skeleton Mosaic, a rather whimsical skeleton bearing wine jugs, found at the House of the Faun. 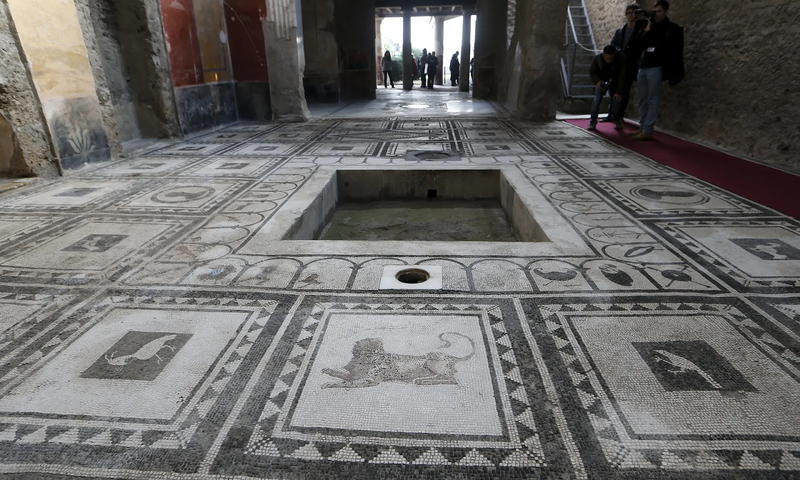 The range of subjects and the sheer volume of impressive floor mosaic installations provide new discoveries for both archaeologists and tourists who visit the ruins, eager for fresh examples of Pompeii history. The ash that destroyed and buried the city preserved the artwork to a remarkable degree. Pompeii, city of thermal baths and hospitable lava terraces for building, was doomed to succumb to the same volcanic forces that aided its development. When Vesuvius erupted, it could be seen for miles. Pliny the Younger, the writer who observed the incident from far across the Bay of Naples, described the event in a letter, comparing the “cloud of unusual size and appearance” to a pine tree which “rose to a great height on a sort of trunk and then split off into branches”; Even now, this sort of volcanic event is referred to as a “Plinean eruption”. Ash fell first, and many residents fled. Not all did, and around 2000 of them perished when a catastrophic event known as a pyroclastic surge came down the mountain and consumed everything in its path. The superheated poisonous gas and pulverized rock created the body casts of those who failed to escape, including not only families, but animals. When the survivors returned to look for their homes and friends, the city was buried, and subsequently abandoned. Today, Pompeii is still being restored, and visitors can visit buildings preserved so well that they can easily imagine the way life must have been prior to the AD 79 eruption. Graffiti still marks walls, mosaics of fish and other products mark shops for illiterate slaves running errands, and one can walk through ancient bathhouses, workshops, and palatial dwellings such as the House of the Faun (covering an entire city block), the Villa of the Mysteries, and the House dell’Ancora. 20 kilometers away from Pompeii, the smaller and wealthier city of Herculaneum was the home of extravagant vacation estates for Roman senators, as well as agricultural holdings. When Vesuvius erupted, the area was engulfed in a cataclysmic flow of lava and gas – barrelling into the city with the force of a hurricane and temperatures of over 1000 degrees Fahrenheit.It buried buildings under a layer of tufa that reaches up to 50 feet in depth. Unlike Pompeii, the archaeologists working at this location have uncovered wood pieces, whole skeletons, and even fabrics and food. 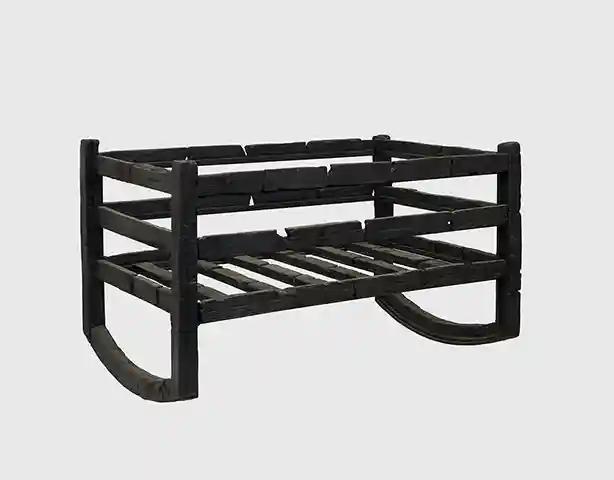 The high temperatures actually carbonized wood furniture, preserving items such as baby cribs, linen chests, garden benches, and stools. Although well-preserved under the layers of ash and debris, the organic artifacts were highly susceptible to decay once exposed to air and moisture – sometimes deteriorating within days. Better conservation methods became a priority in the 1980s, and the preservation of the remains was assured. Today, the Herculaneum site has been cited as “a textbook case of successful archeological conservation.” Although it was once beset by degrading frescoes, fragmenting mosaics,and rotting wood supports, philanthropic efforts have created the Herculaneum Conservation Project, which performs both the invisible structural work and the more spectacular public area restorations, including walkways to the famous skeleton casts and entire buildings, such as the colorful depictions of Roman gods seen in homes. The wealthy owners of the estates in Herculaneum left examples of the very finest and most extravagant art and personal goods. 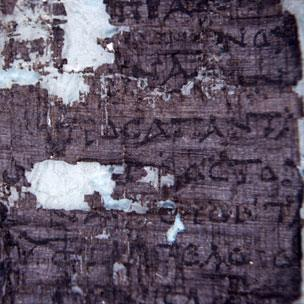 One villa, believed to be the home of Julius Caesar’s father-in-law Lucius Calpurnius Piso Caesoninus, is known as the Villa of the Papyri, as over 2000 papyrus scrolls were discovered in its library section. They are still being analyzed today. 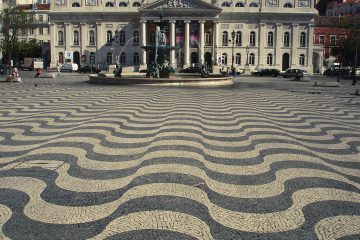 The location was incredible, the architecture enviable, and the contents some of the finest found. In the 1970s, billionaire J. Paul Getty built a reproduction of the villa on his Malibu, CA ranch. 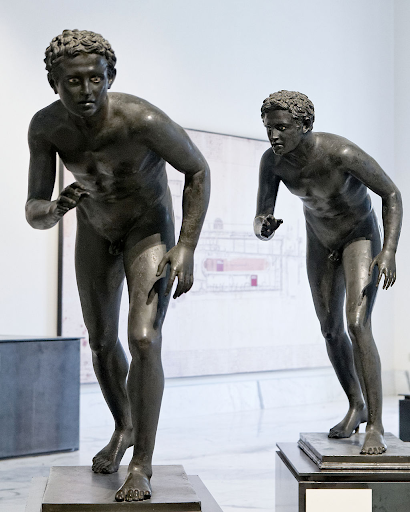 Bronze statues from the villa are considered masterpieces – portraying statesmen, mythological events, and other figures. Nearly pristine pieces of fine jewelry were abundant. 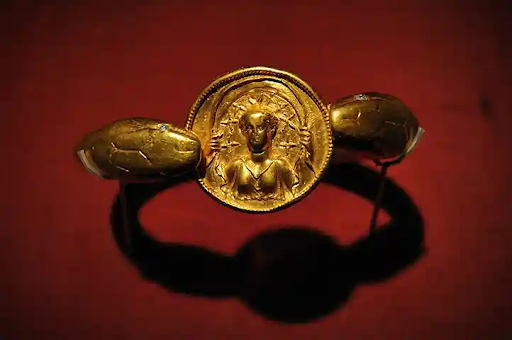 The residents of Herculaneum knew luxury, adorning themselves with ornamental gold in the form of bracelets, rings, and necklaces in profusion, as was the style of the day. 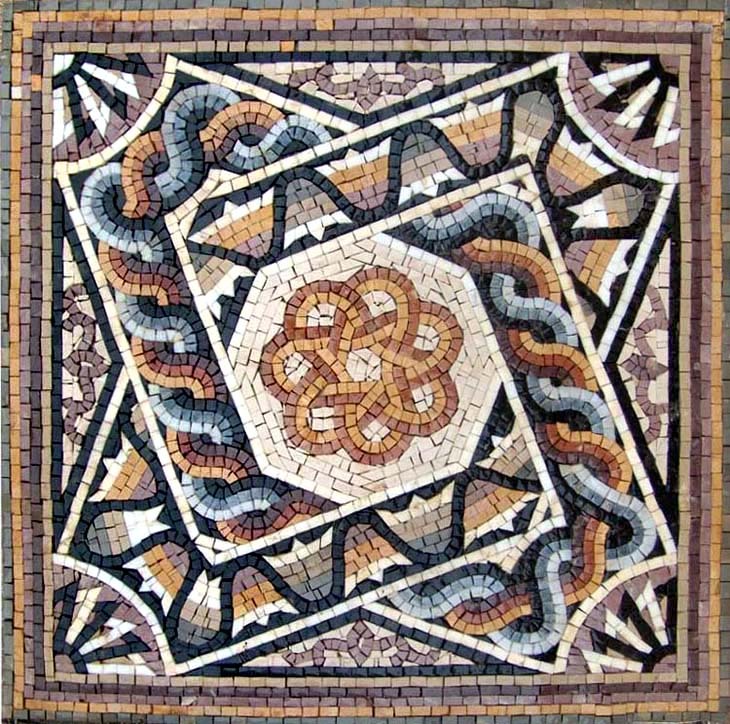 Mosaic art also was an important and ever-present part of life among the residents. Incredible examples have been found, preserved, and exhibited in museums. The Roman senators who took their holidays in the shadow of Vesuvius favored heroic depictions of characters like Alexander the Great and the fabled founder of the city, Hercules. 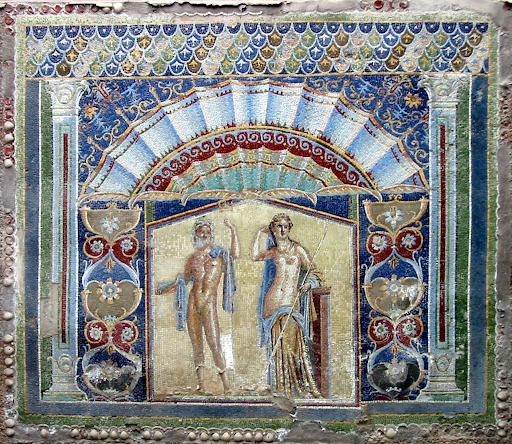 The quality of the marble and mosaic in Herculaneum reflects the affluence of the city. 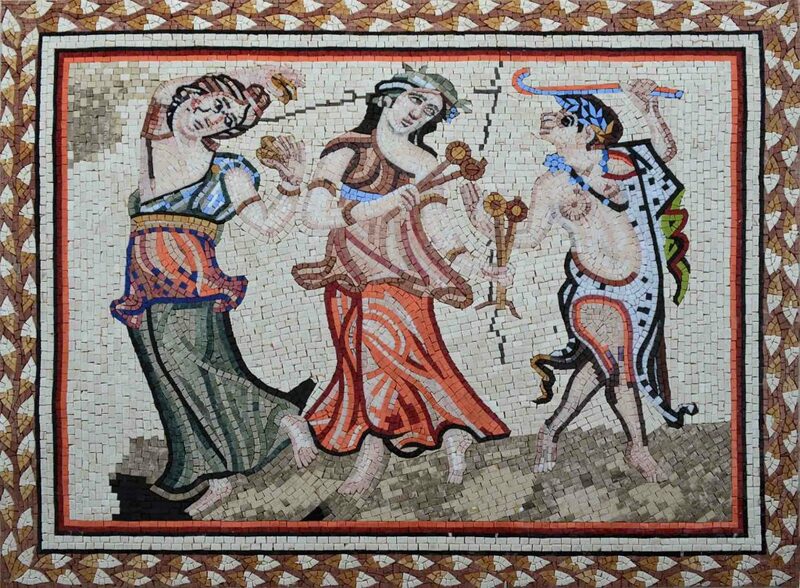 Their craftsmanship and style are still highly influential in the mosaic art of today – over 1900 years later. It’s quite incredible that the colors and intricate work that went into these ancient pieces have survived and continue to influence modern decorating. Although the survivors of the Herculaneum catastrophe were able to escape by sea, they, like their Pompeiian neighbors, were never able to return to their idyllic vacation homes by the sea. Today, visitors to the area can tour both cities on foot, as well as visit fine examples of art in the excellent National Archeological Museum of Naples. 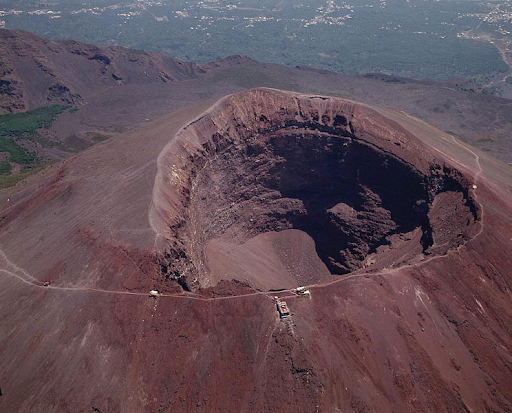 Vesuvius is still an active volcano, and can be visited and hiked. Its last eruption was 1944. 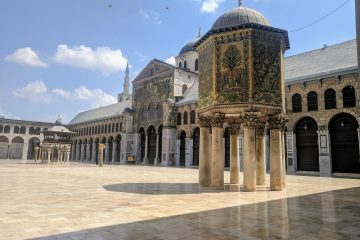 We hope that you’ve enjoyed your virtual visit to these UNESCO treasures, and perhaps visit them in person one day. 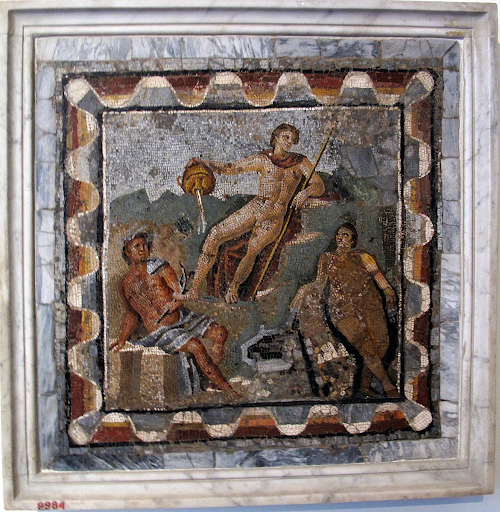 Although its difficult to bring back souvenirs that approach the beauty of the mosaic pieces you can view in Pompeii and Herculaneum, you can enjoy the beauty of this form of art in your own home. 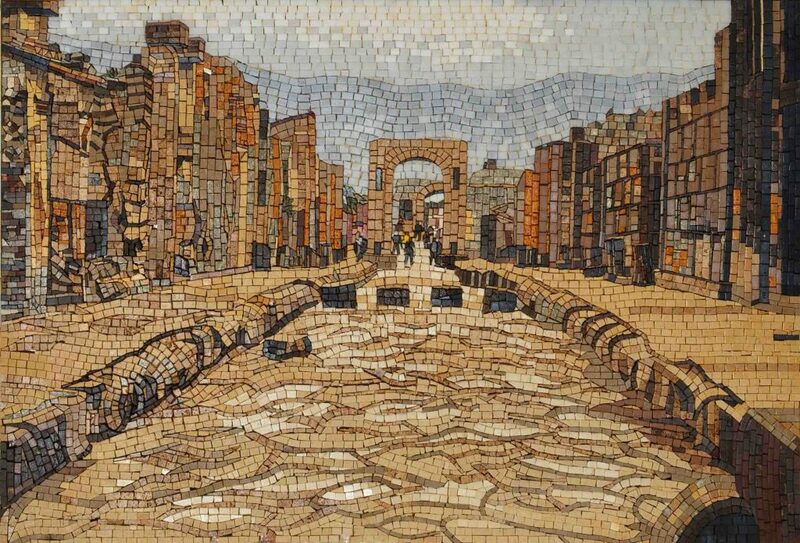 For a vast multitude of mosaics, both pre-designed and customizable, please visit Mozaico, a global retailer of all things mosaic.